If you’re looking to invest in real estate, commercial properties present plenty of opportunities. However, you need to consider the risks and market drivers. This commercial property investment guide will help you. You must think about more than the property investment basics when investing in commercial real estate. There are many complex market issues at work, which means you take on more risk. Understanding these issues will play a role in the success of your investment in real estate. Commercial properties come in all shapes and sizes, which you must account for. This commercial property guide will equip you with the tools you need to succeed. The strength of the economy. A weak economy means there are fewer businesses available to lease your property. Keep an eye on the data. For example, transport sector growth indicates that an economy is getting stronger. Infrastructural improvements influence businesses’ decisions. For example, the building of new roads usually results in an influx of companies to an area. Buy your commercial property with future developments in mind. The Reserve Bank of Australia’s (RBA) interest rates have an effect. If interest rates are on the rise, you’ll find less success with your commercial property. The cost of money increases. This places your potential tenants under greater financial strain. Conversely, low interest rates lead to more demand. Population growth in certain regions will affect your decisions in real estate. Commercial properties do well in areas with large populations. This is because the demand for services increases, which leads to an influx of businesses into the area. You should also consider population demographics. For example, areas with a lot of retirees will have more need for medical services. However, areas with lots of children need more family-oriented services. Use population demographics to find out about the types of businesses that will express an interest in your property. Commercial properties tend to stand vacant for longer than residential properties. You will have to handle the costs of the property during such periods. As a result, it’s usually best to tie commercial tenants to long-term leases. New property construction always presents a risk to your investment. Your tenants may decide to explore their options, which could lead to vacancies. It’s the issue of supply and demand. The more supply, the harder it is to find tenants. You also won’t be able to charge your tenants as much when there are other options available. Size is an issue. Large commercial plots cost a lot more to maintain, and are only suitable for certain types of business. Smaller plots may be cheaper, but they also have their limits. You must consider the local demand for services before deciding on the size of your commercial investment. Infrastructural improvements in other areas represent risks for your established commercial properties. Your tenants may make the move to the new area, which means you lose out. As a general rule, try to invest in properties that are close to central business districts (CBDs). Commercial leases can extend from three years up to 10. The longer the lease, the less risk of vacancy. However, a bad tenant on a long-term lease could cost you. Offer the option to renew if you’re confident in the tenant’s ability to make on-time payments. Link your rent increases to the Consumer Price Index (CPI). You may require council approval for some types of business. For example, chemical treatment plants need to have the correct documentation. Insert a condition that compels the tenants to revert the property to its original condition upon leaving. This will make it easier for you to rent the property out again when you current tenant departs. Further to this, you need to arrange proper financing for your purchase. Many residential lenders can’t help you with commercial properties. As a result, you may have to locate a specialty lender. Furthermore, you may not be able to borrow more than 70% of the property’s value. You’ll also deal with a commercial agent, rather than a real estate agent. These professionals specialise in attracting the right businesses to your property. They’ll also help you to create attractive deals for potential tenants. As you can see, commercial investment is a complex subject. This commercial property guide will equip you with the tools you need to succeed. 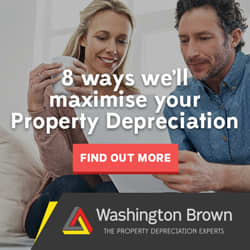 The team at Washington Brown can also help you to claim depreciation on your commercial property. Contact us today to speak to a Quantity Surveyor.